A common strategy in any software project is to have a pipeline of environments. You start with a development environment to make the required changes, which are then promoted to a test environment for QA. Those changes get signed-off by your business users in a UAT environment before finally being deployed to production when all stakeholders are confident in the release. 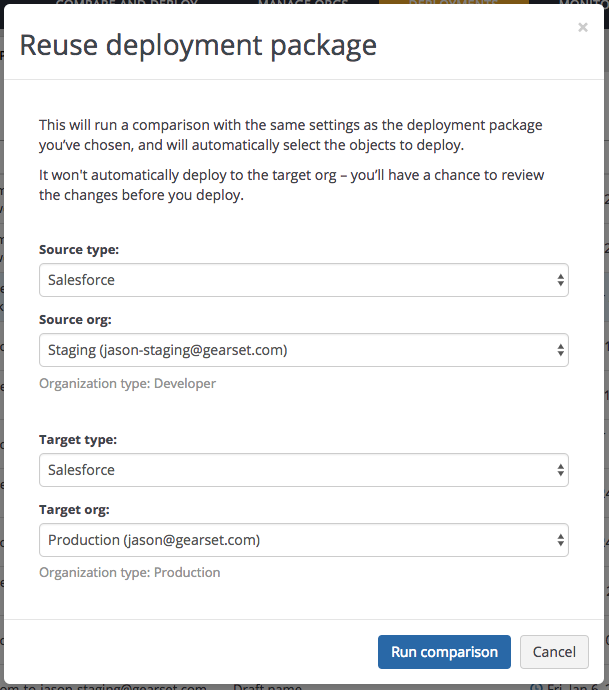 Gearset makes it easy to create a new deployment based on an existing one. It works by allowing you to select a previous deployment and specify a new source and target environment. Gearset will then compare the new environments and automatically pre-select the components from the deployment being cloned. You can then click straight through to the pre-deployment summary to rapidly deploy the same changes out to a new environment. Packages can also be cloned from source control systems as well as Salesforce orgs. With this workflow, Gearset helps introduce simplicity, rigour and compliance into your release process, and ultimately prevent those pesky bugs from making it through to production. To learn more about release pipelines, read our blog post or our release management white paper. To learn more about running a deployment, see this help article.